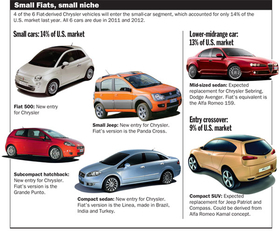 So Fiat is riding to Chrysler's rescue with small, fuel-efficient European vehicles, right? Four of the six new vehicles from Fiat will enter the small-car segment, which Chrysler had abandoned. That crowded segment covers only 14 percent of the entire U.S. light-vehicle market. The two other vehicles simply will replace current Chrysler vehicles. So in the coming years, the bulk of Chrysler's revenue still must come from current big-volume mainstays such as the Dodge Ram pickup and Dodge Grand Caravan minivan. Chrysler will need billions of dollars to keep them fresh — a major challenge for a broke company fighting to emerge from Chapter 11 bankruptcy protection with government loans and a very limited new-product pipeline. Here's the rub for Chrysler: If fuel prices rise above $4 a gallon again, the small-car segment could grow quickly, and Fiats could boost volume, revenue and perhaps margins. But high fuel prices would hurt sales of Chrysler's traditional strength: light trucks. Market analyst Tracy Handler of IHS Global Insight said U.S. small-car sales "are pretty small volumes" but could grow by 2011 when the first North American Fiat designs are built. "The volumes need to be big for Chrysler to survive," she said. "Will they be? I have doubts about that." Fiat sources say the Italian automaker and Chrysler are tentatively planning six vehicles that could be built in Chrysler's North American plants relatively quickly, starting in 2011 with a small Jeep and a subcompact hatchback based on a new generation of Fiat's highly successful Grande Punto. In 2012, Chrysler is looking at adding a compact sedan based on a stretched Grande Punto, plus a compact SUV and a mid-sized sedan based on an Alfa Romeo model. The two other Fiat-Chryslers likely will replace the underperforming Chrysler Sebring and Dodge Avenger mid-sized cars and the Jeep Patriot and Compass small SUVs. They keep Chrysler in those segments but probably will add only modestly higher revenue. Chrysler dealers also might sell Fiat- and Alfa Romeo-badged models built in Chrysler plants, such as the tiny Fiat 500. The Fiat vehicles are the heart of the automaker's European lineup and have fueled Fiat's rebound there over the past four years, from No. 6 to No. 4 in April sales in Europe. In the United States, small-car sales soared a year ago as gasoline prices rose to more than $4 a gallon. But they have since fallen as fuel prices dropped by half. 1. Attract more entry-level customers to Chrysler at the bottom end of the market. 2. Grow to cover more of the market. 3. Burnish the environmental image of Chrysler brands. Chrysler President Jim Press acknowledges the limits of small cars in America. "Especially the A segment and B segment are not substantial volume," Press says. The A and B segments are both smaller than the Ford Focus. But, Press says, "They do have a big impact on entry-level customers." He predicts those segments will grow in response to fuel-efficiency regulations and concerns about greenhouse gases. And small, fuel-efficient cars will help the image of the rest of Chrysler's lineup. Press says the Dodge Ram and Toyota Tundra pickups get equal mileage, but many people assume the Tundra is more efficient because of Toyota's small cars and the hybrid Prius. Further, Fiats will grow beyond subcompacts and compacts. "The underpinnings of their products allow us to do not just A and B segment but C and D segments and crossovers," Press says. "They're excellent mechanicals, very efficient. "It's the beginning of what could be a renaissance of product here." By the time Fiat products roll off Chrysler assembly lines, they will face fresh competition in small cars from such automakers as Ford, General Motors and Nissan. Chrysler's product development — once an industry benchmark for efficiency — suffered under Daimler AG ownership and further eroded under Cerberus Capital Management LP. The subcompact Neon was killed, and the mid-sized twins, the Chrysler Sebring and Dodge Avenger, were decontented and weak when they were introduced in 2006. Beyond the redesigned Jeep Grand Cherokee, due in 2010, Chrysler has little of significance in the product pipeline. Fiat CEO Sergio Marchionne said his company will provide no capital for any ongoing Chrysler product. Chrysler is in bankruptcy and previous owners Cerberus and Daimler have surrendered their equity. That leaves the U.S. government as the remaining potential source of future product development funds. Fiat's North America-built cars will give Chrysler a useful freshening at the bottom end. But by themselves, they likely cannot generate the volume or profits to get Chrysler off government support. Chrysler's best bet for that is a rebound in its current lineup.